L.C. Lewis (Laurie) was born and raised in rural Maryland, surrounded by history-rich Philadelphia, Washington, and Baltimore. She and her husband Tom reside in Carroll County, Maryland, where they raised their four children. (2007), Twilight’s Last Gleaming (2008), Dawn’s Early Light (2009), Oh, Say Can You See? (2010), and In God is Our Trust, (2011). Dark Sky at Dawn and Twilight’s Last Gleaming were finalists in the 2008 USA Best Books competition. Oh, Say Can You See? was a 2010 Whitney Award finalist. Three new books are in progress. Please watch for her remake of Awakening Avery, a political suspense novel titled The Shell Game, both of which are slated for later in 2016, and a March 2017 novella, Laurie’s contribution to the multi-author “Destination Billionaire Romance” series. Laurie loves hearing from her readers and may be contacted through her website: www.laurielclewis.com. You can also follow her on Twitter @laurielclewis or on her blog at www.laurielclewis.blogspot.com. She also enjoys interacting with book clubs. Contact her to arrange a video chat with your group. The back of the book contains some thought-provoking book club questions. Laurie would love for you to schedule a video conference with her if their book club chooses The Dragons of Alsace Farm as one of their selections in the next six months. You can email her at: laurielclewis@laurielclewis.com. First and foremost, The Dragons of Alsace Farm is a love story, about the power of tested love, the promise of new love, and the strength of family love. Here’s a love basket, with a fun date night, Agnes’s favorite breakfast for the morning, and an autographed copy of the book to read on a lazy afternoon. Always remember love. 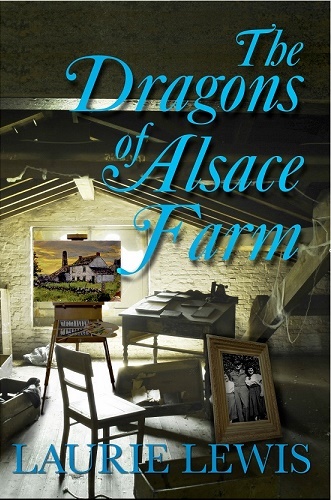 Enter here for the chance to win a paperback of The Dragons of Alsace Farm. A gentle, wrinkled hand reached up to wipe Tayte’s tears. “There, there,” said Agnes, opening her arms wide, offering comfort to the crying girl. Tayte left Tyler’s side and stepped into that waiting embrace. Gone were the smells of fresh bread and jam. The essence of familiar French cologne Agnes had undoubtedly dabbed on at the mention of company was marred by traces of some foul scent that lingered in her clothes. Tayte pulled back momentarily, but unable and unwilling to resist the offer to be loved, she laid her head on her grandmother’s shoulder and hugged her right back. She hadn’t even realized how deeply she ached to experience the osmosis of love exchanged when maternal arms wrapped around her, but now that she was within that circle, she felt comfort and love soak into her, filling the void and renewing parts of her that had felt stone cold. Her aversion to dirt and to her grandmother’s tainted scent dissipated the longer they embraced, dispelled by the logic that with enough soap and water, all could be made right. Tayte didn’t want the moment to end, but when Agnes pushed her back and framed her face in work-worn hands, those aged eyes gazed into Tayte’s with so much love that her young heart burned more fiercely.